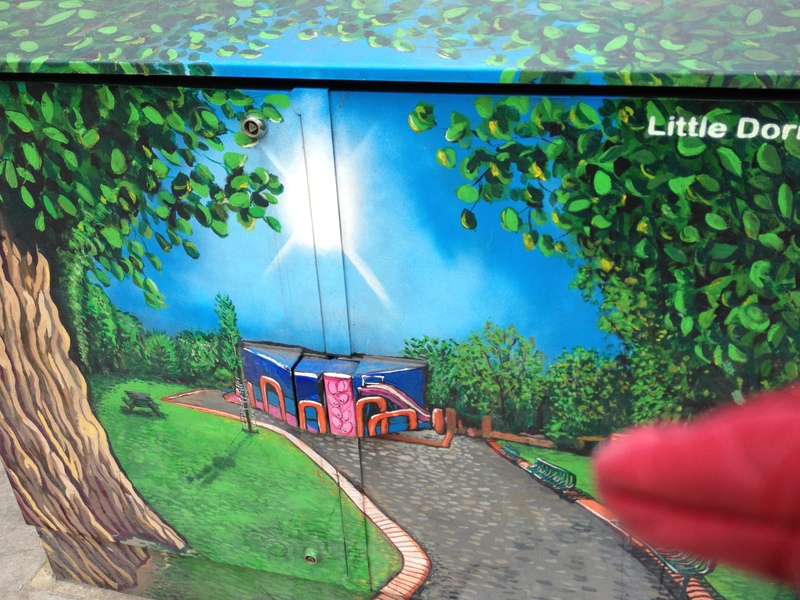 A big part of the Gorgeous Gorse Hill project is our plan to brighten up shop shutters and telephone exchange boxes with ‘street art’. Some people have expressed concerns about how it will look – will they like it? Will it get vandalised? Will it just look like graffiti? The first thing to say is that we’ll be using a professional artist – we’re not setting to the shutters ourselves with a can of spray paint! We’ve sent the tenders out and will be selecting the artist by the end of October. We’re asking for examples for their work and how they’ve collaborated with communities to come up with something that (hopefully) most people will enjoy looking it. We’ve also had a positive response from Gorse Hill Primary School about getting the kids involved, doing some drawings on the theme of ‘local flora and fauna’. The idea is the professional artist will take these drawings and work them up into something that will work on shop shutters. Business owners will have a chance to input too, given it’s their shutters we’ll be painting! Ultimately, art is a matter of taste. What we do won’t please everybody, but we hope that as we’re all locals ourselves, and by involving others in Gorse Hill as much as possible, we’ll come up with something that makes most people happy. We also hope that making this a community effort means it’s less likely to be vandalised. Our view is that we could stick with the existing boring, drab shop shutters. Or we could take a bit of a risk and try to bring some colour into our streets. I know what I’d rather! Oh, and our distant ancestors, the Neanderthals, did some pretty amazing ‘street art’ over 40,800 years ago. Not sure ours will last quite that long though! This entry was posted in Updates by Mary Patel. Bookmark the permalink.